(TibetanReview.net, Jul03, 2016) – Tens of thousands of people in Hong Kong staged a protest rally on Jul 1 to mark the 19th anniversary of the special administrative region’s handover from Britain to China. A much smaller crowd of less than 1,000 government officials and others attended an official flag-raising ceremony at the Golden Bauhinia Square, reported the reported the VOA Jul 1. 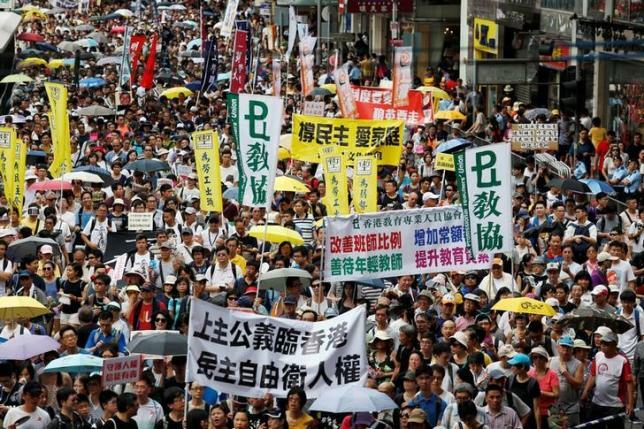 The protesters were reported to be opposed to the oversight over Hong Kong by the government of China and to believe that its Chief Executive Leung Chun-ying, whose approval rating had fallen to 19 percent according to the most recent public opinion survey, was beholden to Beijing. The protesters were reported to have rallied under two themes: to prevent Leung from getting a second term of office in 2017, and to demonstrate anger over the erosion of Hong Kong’s autonomy. The latter was highlighted by the case of five local booksellers who disappeared from Hong Kong and other places last year to be later found held, interrogated an mistreated inside China for months. The main march appeared to have passed off peacefully. However, police later fired pepper spray at a group of demonstrators who they claimed had tried to shove through a security cordon outside government headquarters after the majority of the marchers had left the scene, reported rfa.org Jul 1. The police were reported to have defended their decision to use pepper spray against protesters at an unauthorized demonstration. But RTHK (Radio TV Hong Kong) reporters at the scene have said protesters were trying to leave the area when they encountered a heavy police presence, and were sprayed without warning as a handful tried to push through the cordon. “They also said no verbal warning was issued immediately before the spraying,” the station was quoted as reporting. Earlier, the main crowd was reported to have gathered at Victoria Park before marching to Beijing’s representative office in the city, carrying banners and chanting slogans calling on Leung to resign. Others were reported to have marched with yellow umbrellas, a symbolic reference to the 79-day “Umbrella Revolution” in late 2014 demanding fully democratic elections. Many of the slogans were reported to have also protested the detention by Chinese police of five booksellers from the now-shuttered Causeway Bay Books store over the sale of politically sensitive titles to customers across the immigration border in mainland China. One of the five, Lam Wing-kei, who last month led thousands in a street protest at cross-border abductions and political kidnappings, had said he was being followed by unidentified individuals, and felt forced to back out of the protest after having earlier promised to play a leading role.